Hornsby store are having their Morning Tea on Thursday 23rd May 10.30-2.30. 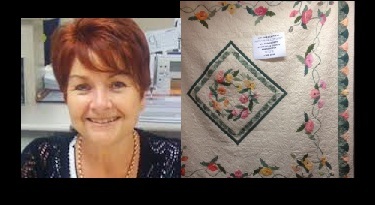 To help raise as much as possible, Donna Warren is offering one of her famously gorgeous quilts to raffle. Tickets will be 2 for $5 or 5 for $10. Ph 9477 5885 for more info. 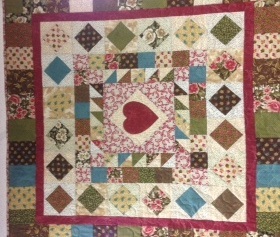 On the same day the winners of the Mad March “Women of Courage” quilt competition, judged by Val Moore, will be presented with their prizes. The Viewer’s Choice prize will also be presented. To make it even more fun, Hobbysew staff are kindly going to bake a selection of goodies to sell on the day with lots of cups of tea. So if Hornsby is your local Hobbysew shop, why not pop along on the 23rd May and help boost their donation to cancer research. 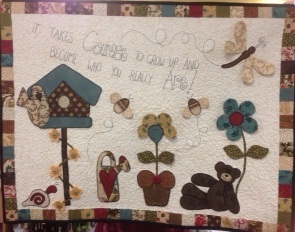 Entries for the “Women of Courage” quilt competition are being displayed @Hobbysew Hornsby shop. 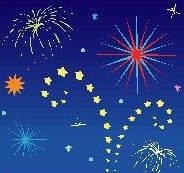 Don’t forget to vote for your favourite to win the Viewer’s Choice prize. As you can see, our new shop in Hornsby is crammed full of the latest fabrics and sewing notions as well as nifty gifts for Christmas. Pop along and browse round a treasure trove of goodies. 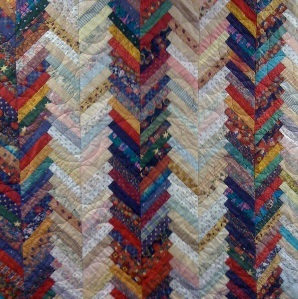 Working on this quilt will give you a link with history. 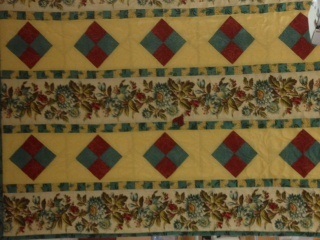 Based on a design which was first made in the 1860’s, this stunning quilt would be a real show-piece in your home. Come & see it in Hobbysew at Hornsby where it is being showcased. Why not sign up to begin your first block in February 2013. For more information about this interesting project, phone 02 9477 5885. Ladies, rev up your sewing machines because Hornsby store is being welcomed into the Hobbysew family on 1st November with a Grand Opening sale which will include 30% off all fabric in-store with a minimum cut ½ metre. 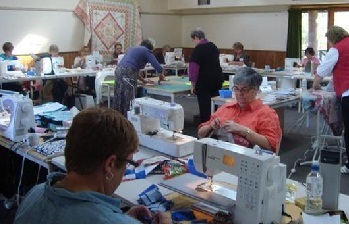 Pop in & join the fun at Hobbysew in Westfield, Hornsby. 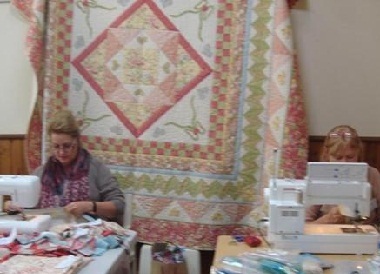 ** On the 2nd Tuesday of every month, Hobbysew Hornsby have a hands-on Bernina Club, run by Ruth Wengi, for the owners of current Berninas to explore their machine’s capabilities and discover new uses for all those feet & accessories. 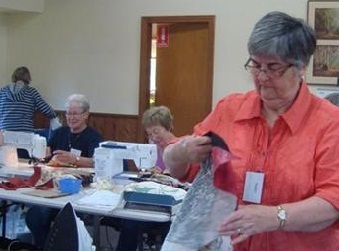 Ruth loves nothing better than to show her students how to get the most out of their Bernina sewing machines so that they can express their individuality with confidence. 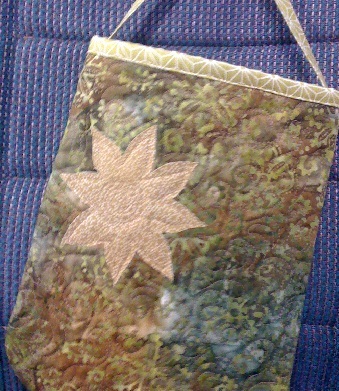 But places are limited in this popular class so you need to book early. 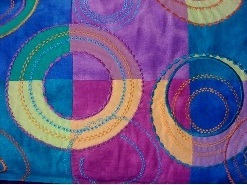 Appealing little Jelly Rolls are a labour-saving way to make bright, fun & easy Strip quilts. 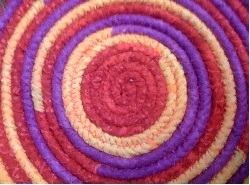 They consist of 40 x 2½ inch strips of colour coordinated fabric, rolled into a disk and tied in the middle. 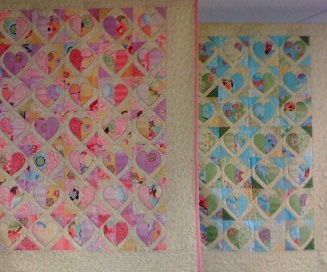 Ruth’s class is for any level of patchworker, so just choose your jelly roll and select a quilt pattern from the many designs available at Hobbysew Hornsby and sign up to have fun! 20 ladies escaped from their husbands and kids to the peaceful, fully catered retreat at Ferndale near Wisemans Ferry. 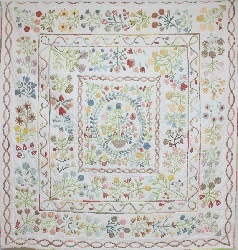 There, they eached sewed a specially designed medallion quilt, while chatting and enjoying scones and cakes fresh out of the oven, lunching outside in the sunshine overlooking the river with a glass of wine, and fab dinners in the evenings, from Friday afternoon to Sunday afternoon. Outrageous! At night they enjoyed the privacy of cabin accommodation with a queen bed, kitchenette, and their own bathroom. As if this weren’t enough, Hobbysew donated a goody bag of products for each participant to take home. 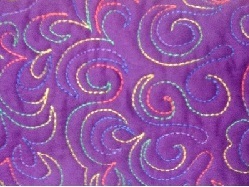 Plans for the next get-away weekend are already being put in place with a special quilt being designed. (Photos to be posted on this website soon.) Unfortunately, the maximum number of people who can escape to Ferndale is 25, so if you would like to enjoy a weekend of outrageous indulgence, the first 25 people to pay their deposit will have their names included on the “Escapee List”. 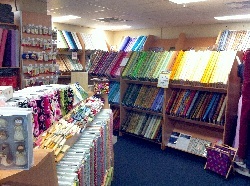 Then you just need to pop into Hobbysew Hornsby to choose your fabrics. 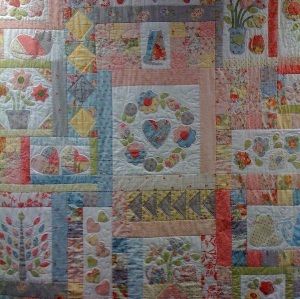 For more details about the quilt pattern, fabric, dates & costs, email Donna, Ruth or Lyn at hornsby@hobbysew.com or phone 02 9477 5885. And while you’re in store, you can lick your lips over the state-of-the-art Quattro 2 embroidery machine, with its famous Colour Shuffling function. For those of you who live too far from Erina, you can also test drive the latest Brother sewing machines at our stores in Hornsby, Top Ryde and Kings Park.